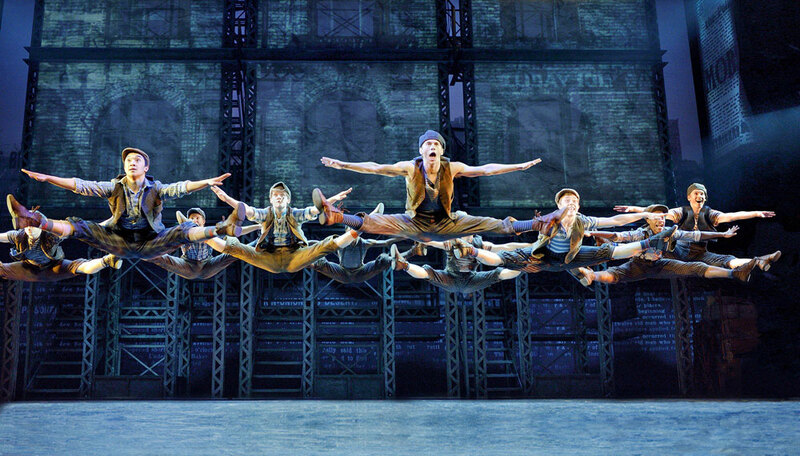 “Newsies forever, second to none.” This quotation from Newsies’ ‘Seize the Day’ certainly rings true when one looks at the Broadway hit’s history. Based on the real Newsboys’ Strike of 1899, the charismatic leader of the Manhattan newsboys, Jack Kelly, forms a union of Newsies when the price of papers goes up (back when newsboys had to buy the papers before they could sell them). The union goes on strike against newspaper publisher Joseph Pulitzer to fight for a fairer price and justice for these kids. Originally a 1992 film by Disney, with music written by Alan Menken, Newsies was a commercial flop, but became a cult movie among its young viewers who grew up watching it. After demanding that Disney Theatrical should turn it into a stage production for years, Disney finally agreed, and in September 2011, Newsies the Musical opened at the Paper Mill Playhouse in New Jersey. With stellar choreography and a brilliant score, the show soon became a hit. After a sold-out run, Newsies transferred to the Nederlander Theatre on Broadway in March 2012, where it ran for over two years. The show failed to transfer to the West End as many British fans had hoped; the rumour is that producers couldn’t find a British male company talented enough to take the production to London, and it is the eponymous Newsies who lead this show. Having been lucky enough to catch the show on Broadway three years ago, and irritating my family with my endless renditions of ‘Carrying the Banner’ for weeks after, Newsies is a production I hold very close to my heart; it was my first Broadway show, and it has that classic, wholesome Disney charm to it which makes it so incredibly special. I was therefore ecstatic when I heard the news that I would be able to watch it once more, and although cinema can never truly emulate the atmosphere of live theatre, Newsies Live was the next best thing, and certainly did not disappoint. Cinema can even add elements to a performance which you would not experience in a theatre, such as close-up shots of the actors’ expressions at crucial moments. It was interesting to witness the camera shots and the angles chosen, which were fairly frantic during the dance routines, as the cameras simply did not know where to look as there was so much to watch on stage. The actors’ energy was incredible from beginning to end, which made this special screening a joy to watch. Portraying multi-talented orphans working on the street in typical Disney fashion, the chorus of newsboys has always been made up of teenagers aged 16 and up and young adults in their early 20s. However, the same cannot be said of the leads this time round. The four main characters were all brought back from the original Broadway cast, and the famous suspension of disbelief used in theatre was evident here. 32-year-old Jeremy Jordan (The Last Five Years, Smash) plays the charismatic leader of the Newsies, 17-year-old Jack Kelly; similarly, 26-year-old Ben Fankhauser plays Davey, a Newsie of similar age to Jack, 31-year-old Andrew Keenan Bolger plays the 15-year-old Crutchie, and 32-year-old Kara Lindsay, heading up the remarkably small female cast, plays journalist and Jack’s romantic interest Katherine Plumber, presumably in her early twenties. Nevertheless, ages and young faces put aside, these four were extremely strong and outstanding leads more than five years on since the musical’s premiere at the Paper Mill. Keenan-Bolger was especially memorable as Crutchie, the young Newsie named after the crutch he carries due to a leg disability, and yet the most optimistic and cheerful of all the boys. Keenan-Bolger gives an endearing performance as a character who has every right to act helpless and innocent, yet is determined to help his fellow Newsies succeed in their strike and see justice delivered. With the heart-breaking new song written for Crutchie in the touring production, ‘Letter from the Refuge’, combined with a close-up shot of Keenan-Bolger’s “smile that spreads like butter”, everyone’s heart in that screening had melted. So, was Newsies a success on the big screen? Simply put, yes. It does the best job possible of presenting the live theatre experience to those who could not see the performance on stage. Moreover, the combination of the Broadway alumni and the touring cast was inspired; mixing experienced leads with fresh faces gave the show a new energy as the actors had new individual performances to bounce off. After screenings across the world, Newsies could be set to break records as the highest-grossing event film ever when it plays encore screenings across the US in March. It is evident that Newsies has touched a whole new generation of theatre-lovers, so who knows where its success will take it next. Newsies premiered on selected UK cinema screens on the 19th February 2017, with limited encore screenings on the 26th February. It is speculated that more screenings may be shown in April 2017.